How can we ensure that densifying Vancouver won't be taken out on the backs of the most vulnerable? When we (Denis and Jens) got together for coffee the other day, Denis showed off some maps of renter density in the frequent transit network that he was working on. The idea immediately clicked and we decided to work this out together. 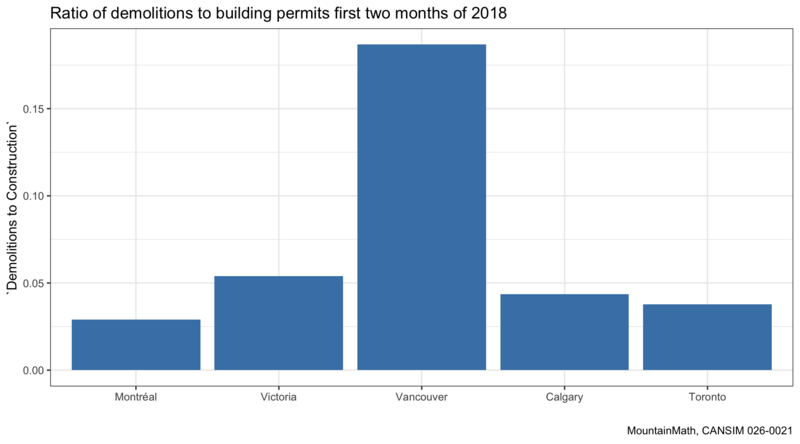 Motivated by the issue of renter demoviction caused by the 2017 Metrotown Plan, we set out to quantify how one could plan for displacement on a regional level, instead of treating it as an unwelcome consequence of development at the lot level. 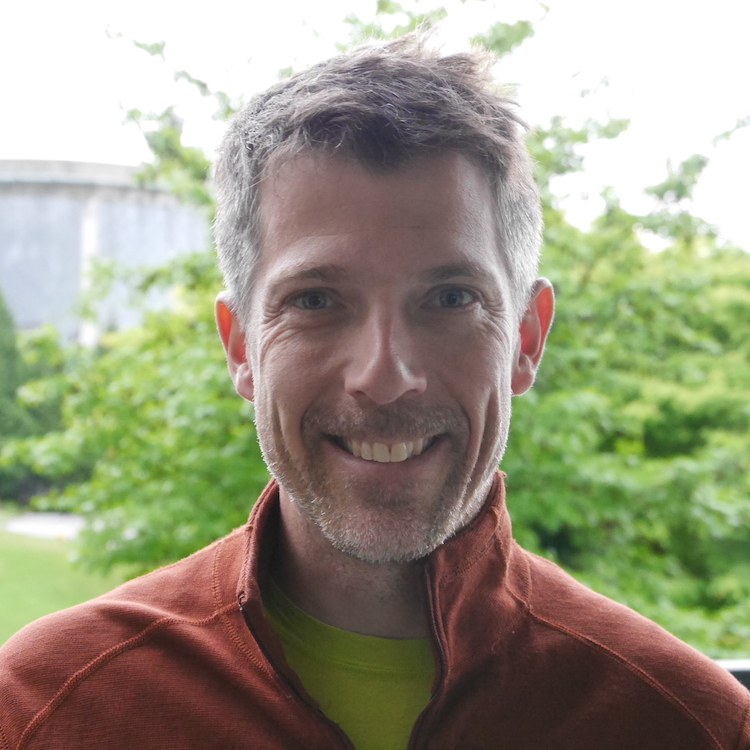 Analysing the impact of Vancouver's teardown cycle on carbon emissions. 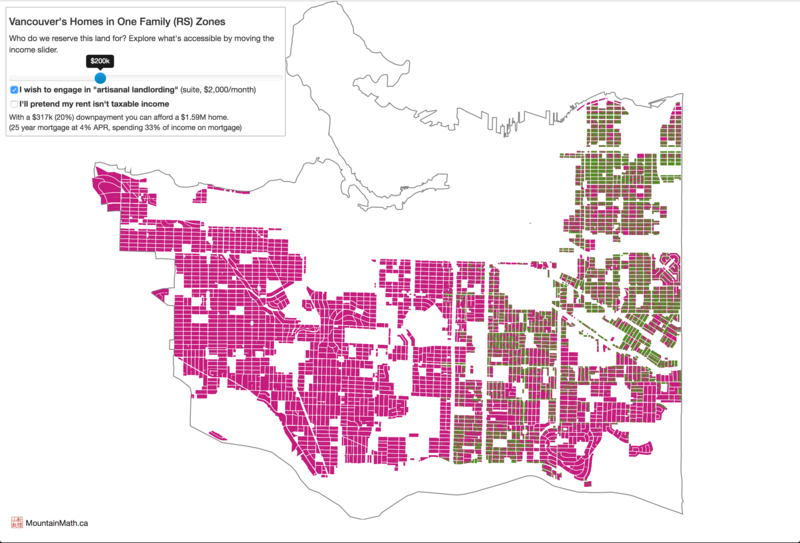 Last year we took a detailed look at Single Family teardowns in Vancouver, that is houses in RS or “Single Family” zoning that got torn down. We focused exclusively on those homes in RS zoning because these have to be replaced by another, often bigger, Single Family home. 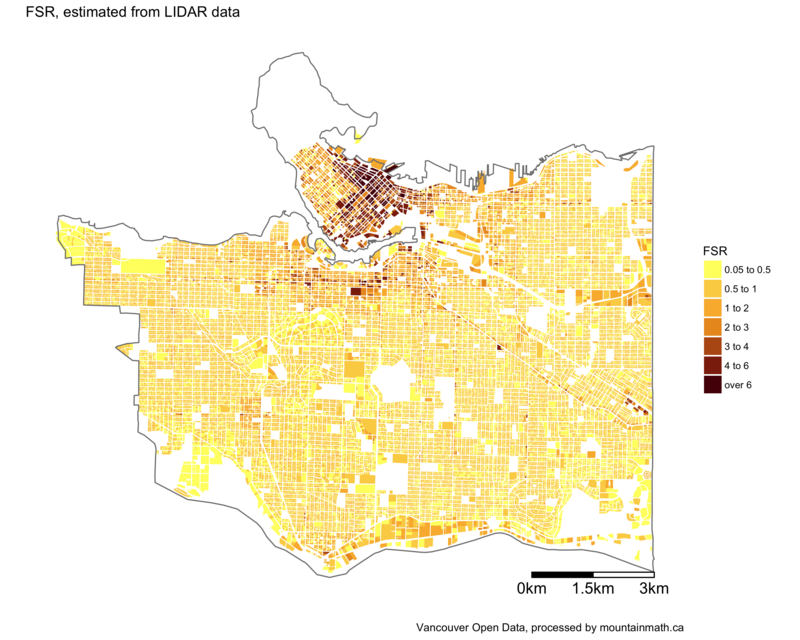 Using historical data we build a probabilistic model to predict future teardowns in Vancouver. If you haven’t taken the time yet to read through the data story, you probably should do that right now. 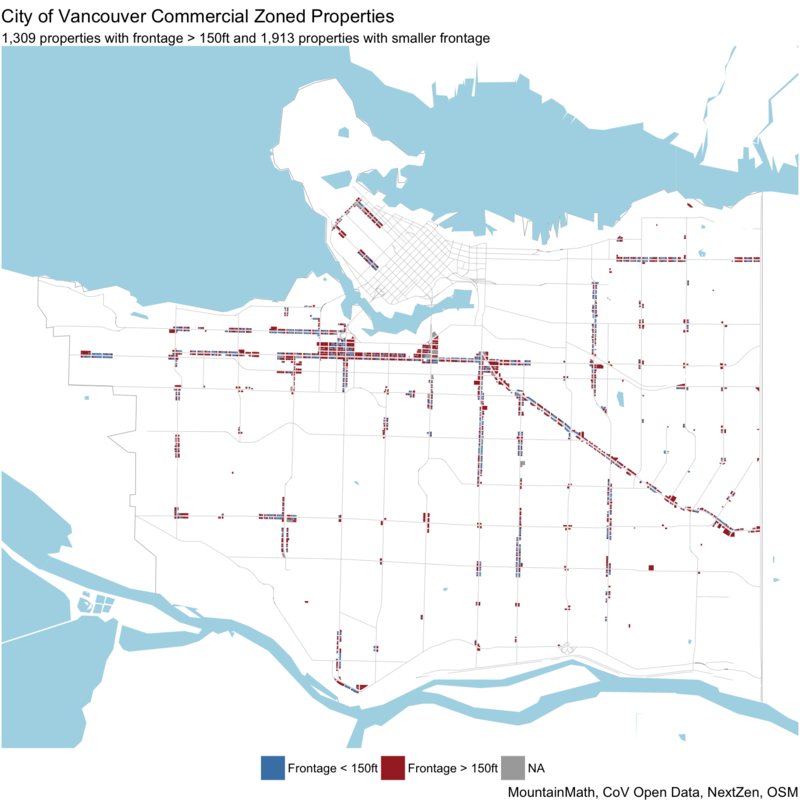 Frontages for commercial zoned properties in Vancouver. Over the past years several people have asked me questions about street frontage of city properties. When I needed similar data for a work project, and Scot Hein asked me a question about frontages of commercial properties for his Urbanarium debate, I decided to finally pull the numbers. The answer to that question is not as straight forward as it might seem, mostly because properties aren’t necessarily square. 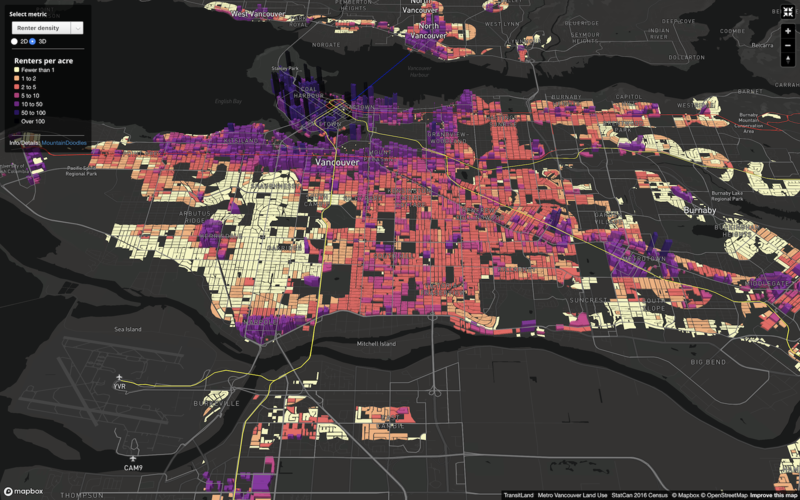 There are a couple of algorithm that can solve this problem, but in this case we can keep things reasonably simple as the City of Vancouver has property frontages listed on VanMap and make the data available on their Open Data Portal. What income do you need to buy a single family home in Vancouver? The night before the council hearing discussing the character home zoning review and changes to duplex zoning we decided to spend some time understanding for who we keep 67% of residential land zoned as “single family” (RS), and another 2% as quasi single family in First Shaugnessey (FSD) and 9% as “duplex” (RT). Keeping things simple, let’s just look at RS. Who Can Afford To Buy? That’s a pretty easy question to answer. Over the backdrop of Vancouver’s rising real estate values the exhibition of the “Vienna Model” at the Museum of Vancouver has triggered lots of discussions about what Vancouver could learn from cities like Wien. There are many angles to approach this, one of them that has received a lot of attention is the much larger proportion of government owned subsidized housing in Wien compared to Vancouver. In this post we want to focus on a different angle: land use.